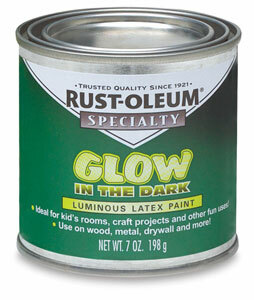 This luminous latex paint creates a glow-in-the-dark finish on wood, metal, drywall, and more. It applies easily and dries fast. Use Rust-Oleum Glow-In-The-Dark Paint for all kinds of applications, including hands on a clock, kids toys, nighttime guideposts, and a variety of special projects. For indoor use only. ® Rust-Oleum is a registered trademark.